I've been tossing the idea of trying out soap nuts for a few months now. I've heard from many people who use them for their cloth diapers and have amazing results, so I finally broke down and bought a box of Eco Nuts on sale from Bippy Diapers. I couldn't wait to try them out! What are soap nuts? 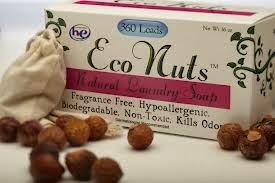 Eco Nuts™ contain saponin, a natural cleaner that works as a surfactant, breaking the surface tension of the water to penetrate the fibers of your clothing, lifting stains from the fabric and leaving dirt suspended in the water that is rinsed away. ...I was sad to see that many things didn't look clean. I'm not diligent with my laundry. I don't pre-treat stains, I just throw things in the hamper and when it's full I wash. However, I still don't have stains on anything. I've used the cheapest commercial detergents, Tide, and most recently, for the past 6 months, Rockin Green, on everything. No stains. I shrugged it off. Eco Nuts recommended I buy a stain pre-treater and try that. So I purchased an additional laundry tool that I've never used before, sprayed what was extra dirty, and washed a load of Buggie's clothes. This time I checked everything that came out of the washer, and still saw streaks of formula on his shirts. Needless to say, I'm pretty disappointed in this purchase. Kudos to those of you out there who can use such an eco-friendly laundry detergent, but I'll be sticking with my Rockin' Green! 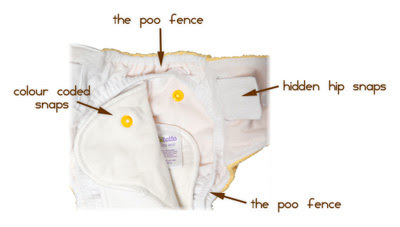 If you'd like to try them yourself, you too can buy them from Bippy Diapers using the link above in this post, or you can also purchase them directly from Eco Nuts! A trial size box for an average of 10 loads is $4.50, and a medium box (which I purchased) which lasts for an average of 100 loads is $12. FTC Disclaimer: I purchased this product with my own money and was not in any way obligated to provide a review. Seriously? I can't believe I've been a mommy for 5 months already! It still feels like we brought Bug home a month ago. What's happened since last month? We were so happy to be given the opportunity by itti bitti to review a diaper, that the anticipation grew that much more when it arrived during the Flats and Handwashing Challenge and we had to wait to try it out lol. "Hey Mama! Look what we got in the mail!" itti bitti is an Australian company that started in 2005 and has grown phenomenally, with itti bitti diapers now being sold in 25 countries! itti bitti launched into the USA in March 2011. Moms worldwide love the ultra trim fit, gorgeous fabrics, superior quality, amazing performance and the rainbow of colors. As you can see, there are 2 sets of inside snaps in the cover, and the snaps on the soakers are color-coded to help you piece them together to get the best performance out of them. The soaker on the top right fits inside the cover perfectly in the lowest snap setting, while the long soaker on the bottom adjusts in length using the blus snaps shown (which are on the bottom of the soaker). The third is a mini soaker, and is shown snapped to the bottom of the long soaker. All the soakers are a 70% bamboo/30%organic cotton blend, and the short and long soakers are topped with a 100% polyester stay-dry layer. The bitti tutto has held up well through a few poop-losions without any seeping or leaking around the legs or waist, and no stains have set in either. Both the cover and the inserts wash up nicely. With the minky cover though, I do not recommend washing these with towels. I don't think many people do that anyway, but we prepped ours with a load of towels and (being picky about the cute new diaper...) I spent some time trying to get the lint off lol. Does anyone else line dry? I dry everything in our apartment on laundry baskets and the whole diaper dries nicely and stays soft. Overall, I love this diaper! No pockets to stuff, but it gets a more thorough wash unlike an all-in-one. It fits my son perfectly, no leaks or red marks. The bitti tutto retails for $26.95, but you can win one here directly from itti bitti (in their choice of color) by entering below!